On October 29, 2003, a 38-year-old male career fire fighter (the victim) was killed and a 48-year-old male career Captain was severely injured when fire overran their position while protecting a residential structure during a wildland fire operation. The National Institute for Occupational Safety and Health (NIOSH) was notified of this incident on October 30, 2003 by the U.S. Fire Administration (USFA). On November 18, 2003, a Safety and Occupational Health Specialist and the Senior Investigator from the NIOSH Fire Fighter Fatality Investigation and Prevention Program conducted a site visit where photographs of the incident scene were taken. A meeting was held with an Assistant Chief and Unit Forester from the California Department of Forestry and Fire Protection (CDF). 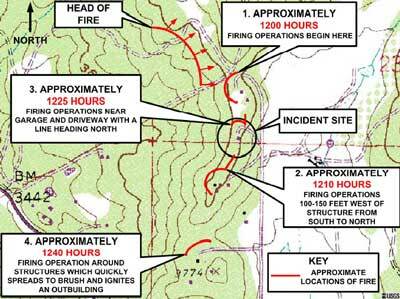 On November 19, 2003, a phone interview was conducted with the home owner of the incident site. On February 3, 2004, a meeting was conducted with a Deputy Chief from the victim’s fire department. On February 3-5, 2004 and March 17-19, 2004, interviews were conducted with the officers and fire fighters from the Task Force involved in this incident. On March 19, 2004, a meeting was held with the Chief Deputy Director and Departmental Safety Officer of the CDF. The NIOSH investigators reviewed copies of the Incident Action Plan (IAP) distributed on the day of the incident, the Sheriff department’s incident report, the CDF Green Sheet, the county medical examiner’s report, the report produced by the victim’s fire department, and the report produced by the CDF. On September 2, 2004, an occupational medicine physician with the NIOSH Fire Fighter Fatality Investigation and Prevention Program traveled to California to meet with and interview the Deputy Chief from the victim’s fire department and the victim’s widow. During this visit, the victim’s medical records were accessed and subsequently reviewed. The victim’s fire department serves a population of approximately 60,000 in an area of approximately 71 square miles. The department has five fire stations and 70 uniformed fire fighters. The victim’s fire department is approximately 500 miles from the incident site. The victim was a California State Board certified Fire Fighter Level I and II, Fire Officer, Fire Instructor, Driver/Operator, First Responder, and Emergency Medical Technician (EMT)/Paramedic. The victim’s wildland fire fighter training consisted of National Wildfire Coordinating Group (NWCG) certified S-130/131/190 (Fire Fighter Training/Advanced Fire Fighter Training/Introduction to Wildland Fire Behavior), S-212 (Wildfire Power Saws), S-234 (Ignition Operations), S-270 (Basic air operations), S-290 (Intermediate Wildland Fire Behavior), ICS I-200 (Basic Incident Command System), and ICS I-300 (Advanced Incident Command System). The victim had 18 years of structural and wildland fire fighting experience. There were approximately 3,662 fire fighters assigned to this fire at the time of the incident. Crews and equipment resources were assigned as follows: 35 single resource and 6 strike team hand crews; 48 single resource engines; 97 strike teams/task forces; 12 single resource dozers; 27 water tenders; and 605 overhead (managers, supervisors, etc). The fire was under Unified Command with the United States Forest Service, the California Department of Forestry and Fire Protection (CDF), and local government. At the time of the incident a strong onshore pressure gradient had developed with sustained winds of 17 miles per hour (mph), and gusts of up to 31 mph out of the west. At approximately 1430 hours, the temperature was 70 degrees Fahrenheit with a relative humidity (RH) of 30%. Size – The incident site was a privately owned home situated along a ridge top that runs in a north-northeast direction. The incident site was a small segment of a much larger wildland fire that consumed approximately 280,278 acres and destroyed 2,232 residential structures, 22 commercial buildings, and 566 outbuildings, damaging another 53 structures and 10 outbuildings. Topography – The incident site was located on a ridge at an elevation of 3,800 feet, 400 feet above the bottom of the drainage, with west facing slopes ranging between 12-20% (Map 1). Vegetation – The fuel models in the immediate area of the incident site were Fuel Model 4-brush (with at least 90% crown closure) and Fuel Model 1-grass (Glossary of Terms). Live fuel moisture values were below critical levels. Fire Behavior – There was a sustained run from the west/southwest directly to the incident site, as the flanking fire established on the west facing slope below the incident site. Flame lengths were calculated to be in excess of 78 feet, fire line intensities in excess of 73,989 BTU/ft/sec, and rates of spread in excess of 16 miles per hour (for the maximum wind speed recorded at 31 mph). The fire took a little under 2 minutes to travel from the bottom of the slope to the top, a distance of .46 miles. All fuels, both dead and live, were totally consumed below the incident site. Residence #1 – CDF FAE (fire apparatus engineer) began firing out around the structure while the CDF Captain drove down the dirt road where he met up with Engine 334. He then instructed them to proceed to Residence #1 to support the firing operation. Two dozers and a Hotshot crew arrived at the north end of the dirt road. One dozer and part of the Hotshot crew started working near Residence #1 and began direct perimeter control in that area. Engine 6162 crew began clearing brush along the driveway to Residence #2 while the Captain assessed the area around the structure. Although the Captain had concerns, after further assessment, the crew determined that the structure is defendable and decides to stay. Residence #3 – CDF Captain and FAE arrived and began firing out operations approximately 100-150 feet to the west of the structure. The FAE laid fire on the ground, from south to north, in the shape of an arc. He continued in a straight line from the top of the arc toward the structure at Residence #2. Fire quickly spread to the east but was knocked down by a bucket drop from Helo 523EH. The FAE discontinued his firing operation at Residence #3. Residence #2 – The CDF Captain and FAE drove their vehicle to Residence #2 and parked near the garage. The Captain instructed the FAE to begin firing out from the garage toward the driveway and to continue in a northerly direction toward the unimproved lot to the south of Residence #1. THE CDF Captain and Captain of Engine 6162 did not make contact with each other. 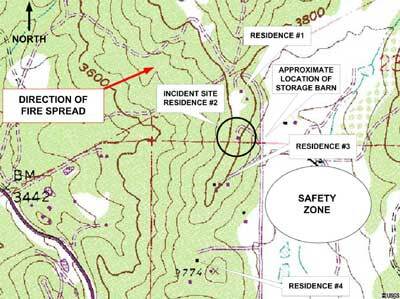 The Superintendent of the Hotshot crew, while standing in the meadow (safety zone), observed unexplained fire along the ridge between Residence #3 and Residence #2 and then between Residence #2 and Residence #1. He radioed his crew who informed him that they were not conducting firing operations. He ordered them to retreat to the meadow. Residence #4 – The CDF Captain and FAE drove south on the dirt road to Residence #4 where they began firing operations around the structures. Fire spread to the brush and ignited an outbuilding. The fire intensified and cut off the egress of Engine 24. Engine 24 had been assigned by the Task Force Leader to protect the structure.